The very first console I ever played was my neighbor’s Atari; the controllers for it were little more than simple joysticks with a pause button in the corner. The original NES found its way into my home within the year and came equipped with standard blocky controllers which left my tiny hands stinging with gamers’ arthritis. Even in those days crazy peripherals abounded. The original NES Power glove was almost completely ineffectual, but undeniably cool looking, in an eighties sort of way. Long before the Wii Fit came onto the scene, gamers were sweating bullets in front of their televisions with the Nintendo Power Pad which was little more than a Twister mat attached to a television. The SNES controller was a similar beast to its predecessor, only there were more buttons and the edges were mercifully rounded. I got so much mileage out of that console that I actually wore out the buttons on several controllers. In hindsight, I should have kept them and had them bronzed; they would be a fine memorial to my gaming tenure. While Nintendo was my favored console early in my gaming career, many of the other name-brand consoles followed a similar development path. As time wore on, controllers became increasingly complex and ergonomic. 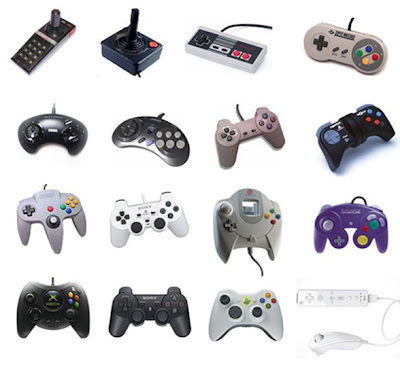 Vast improvements in graphics and programming technology, coupled with a growing consumer base, pushed developers to create controllers which offered superior interactivity and choice. Initially, this simply meant adding more buttons, but that was poised to change. When the Nintendo 64 dropped into the world back in 1996 (yes, it really has been that long), everything changed. 3-D games where no longer a theoretical experiment for developers, almost overnight they had become the standard. The medium had added an entirely new dimension to itself and our controllers had to evolve in turn. Now we needed controls which not only manipulated where our avatars went and what they did but ones which altered our perspective on the action. The N64 Rumble Pac add-on brought an additional connection between the digital world and ours. The Playstation 2 Dual shock controller lead the way toward the adoption of the now popular double joysick multi-button controller configuration we see in all major consoles. Wireless controls have also become an industry standard, further removing us from the umbilical cords of systems past. Rather than sit inert in our hands, modern controllers, shake and pulse in sync with actions taking place in the game, some have built-in speakers for more immersive sound effects, and peripheral devices of every description litter the shelves of gaming stores. Never content with the status quo, we now have controllers (notably for the Wii) which react to body movement rather than merely the manipulation of levers and buttons. Sony is developing similar controls for the PS3 and Microsoft has been creating a great deal of press surrounding project Natal, a devise which removes hand held controls entirely and tracks our body movements instead. The market for video games has never been larger and the developers and distributors of controllers are surging forward to capture our attention with their next great innovations. Responding to the ever growing desire for greater interactivity, they are creating systems that will allow us to control digital worlds with our very bodies and minds, and all of this progress has happened in less than thirty years. Just imagine what kinds of controllers we will be using thirty years in the future. 30 years? no controllers, just our minds.